Milk, wheat and gluten free white sauce for lasagne. Lasagne. Preparation time 5 minutes. Cooking time 45-55 minutes. Method: Hob and Oven cook. 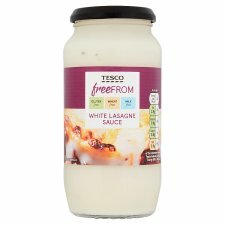 Ingredients 500g beef mince; 15ml (1 tbsp) of oil; 1 jar Free From Bolognese Sauce; 1 jar Free From White Lasagne Sauce; 1 pack Free From Lasagne Sheets; 80g suitable grated cheese or Free From alternative. Method:1. Pre-heat oven to 200°C/Fan 180°C/Gas 6. 2. Heat 15ml (1 tbsp) of oil in a pan and fry the mince for 5-10 minutes or until browned all over. 3. Add the jar of Free From Bolognese sauce and gently simmer for 10-15mins.4. Pour 1/3 of the mixture into an ovenproof dish with a layer of pasta sheets and cover in Free From White Lasagne sauce. 5. Repeat with a further layer of Bolognese/pasta/white sauce and finally sprinkle with cheese. 6. Bake in the pre-heated oven for approximately 30 minutes or until the pasta is cooked. All appliences vary, these are guidelines only. Check foof is piping hot thorought before serving. INGREDIENTS: Water, Coconut, Modified Maize Starch, Rapeseed Oil, Salt, Sugar, Acidity Regulator (Lactic Acid), Stabiliser (Xanthan Gum), Yeast, Maltodextrin, Black Pepper, Garlic Purée, Flavouring, White Pepper.